Lieutenant’s spotted… no end in sight. A common theme in the Marine Corps is “Officer’s command, NCO’s lead.” Every service praises the critical tasks which NCO’s are responsible for … So why is the ratio of enlisted troops to officers declining across the US forces? Officers may have the ultimate responsibility for employment and performance of the units which they command, but NCO’s are the ones who ultimately achieve the tactical objective on the ground. If this is true for combat units whose task organization has remained relatively unchanged, what can explain this trend? The table above tracks the enlisted to officer ratio across all military branches. Each respective service (excluding the Air Force, which already has the lowest ratio) has increased their overall officer manpower in comparison to enlisted. Each service is broken down further below. Since the year 2000 the United States Military has decreased its total Enlisted Members to Officer ratio by 12%. Army decreased enlisted to officer ratio by 21% since 2000. 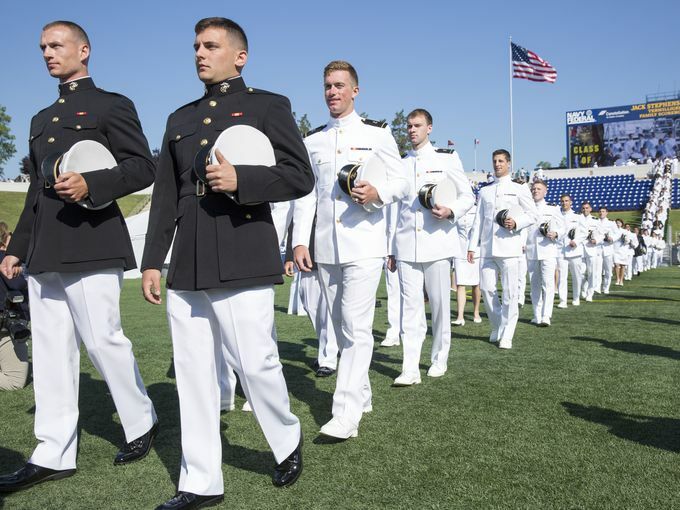 Navy decreased enlisted to officer ratio by 15% since 2000. Marine Corps decreased enlisted to officer ratio by 9% since 2000. Air Force has decreased enlisted members to officer ratio by 2% since 2000. Have the demands on the post-9/11 military changed so dramatically to account for the shift in manpower? A historical perspective displays how different the organization of forces is compared to the contemporary military. Historical Trends – What’s Changed? Looking at the structure of military manpower shows a continuing trend over the past 150 years of less enlisted troops for every officer. What factors have changed in how we conduct war that could possibly explain this shift? One possible factor is the way in which our current military is structured across the globe. As a comparison, the organizational structure during the Civil War included ten Armies of the Union, each with a Major General commanding roughly 80,000 soldiers. The current structure is far more complex. Traditional commands for units such as the 82nd Airborne Division or 1st Marine Division remain. However, these divisions have not deployed as units during the GWOT, with the exception of the 2003 Invasion of Iraq. Once an individual battalion is deployed, they then report to entirely different command which is generally geographically focused. Each combatant command is run by a four-star General, and the Combatant Commands tend to be officer heavy in their staffing. More commands require more officers to fulfill staff billets and command billets. Additional explanations may be due to the advances in weaponry and machines available. As an example, the Army inventory of aircraft (fixed wing and rotor wing) is over 4,000 total. Each aircraft is flown by a commissioned or warrant officer, further inflating the total required number of officers. The advances in the size of Navy vessels require additional officers. The influx of tanks, artillery, remotely piloted drones, and other valued assets are staffed with a heavier number of officers. The increasing size and reliance on communication technology may have created additional billets requiring junior officers, further compounding the issue. It’s challenging to truly determine what has caused the continuing shift in manning. Have the responsibilities which once were within the realm of NCO’s now expected of officers? Has the military adopted micro-management techniques which require heavier officer numbers? If the trend continues, perhaps the most interesting question may be the whether or not the military will continue to have both officers and enlisted or just one general rank structure.